Six years ago in late August, Rich Levad, Rob Sparks, Jason Beason and Ken Behrens hiked through spruce fir forest to a spot just above timberline where a Black Swift nest clung to a wet, rocky outcrop. The outing was part of Rocky Mountain Bird Observatory’s effort to collect baseline data on this little-known species. When no swifts were seen that evening, the scientists wondered if they had already started migrating – and where did they go? A couple of clues had led some ornithologists to infer that Black Swifts migrate to South America for winter from their breeding grounds in North America. In 1993 Stiles and Negret discovered a Black Swift subspecies, niger borealis, in Colombia. Also, the lack of feather molt on Black Swifts sighted before or during migration, gave rise to speculation that Black Swifts have a long migration route and molt after migration. Now the research team has cracked the mystery of the swifts’ migration path and winter destination using geolocators. So when do Black Swifts migrate south? 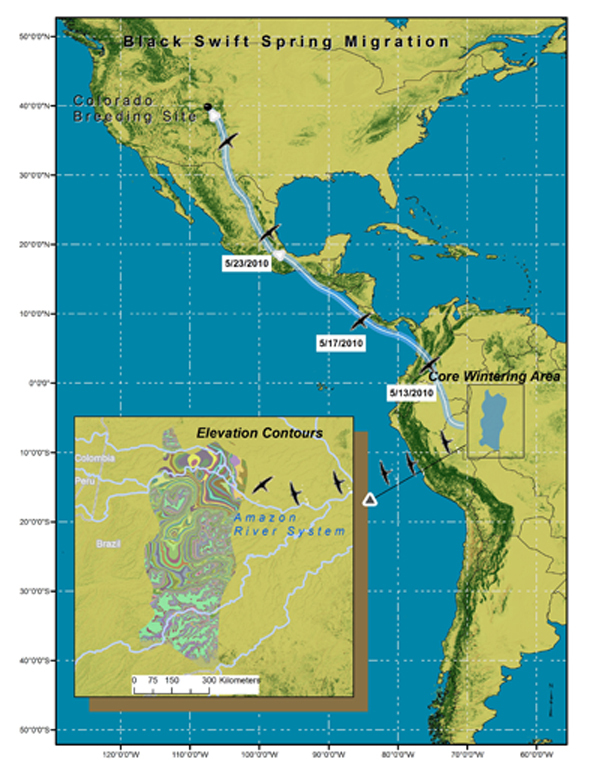 Rob Sparks conducted the analysis for this study and graphed longitude and date to get migration windows for all three swifts from which geolocators were recovered. The graph below shows the rate and timing of each individual and where they overlapped on their journey south. 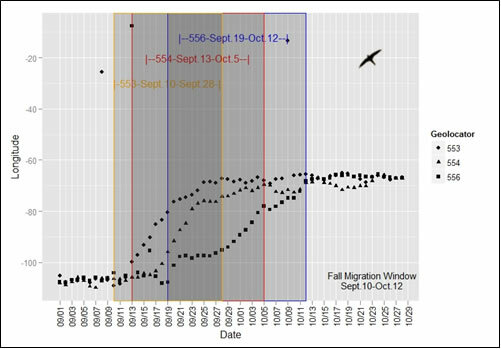 Interestingly, the fall migration window overlapped that of the Black Swifts seen by Stiles and Negret (Oct.3-Oct.12) in Colombia. The map below shows the birds’ spring migration (range May 9 to June 18). The geolocators revealed that the Amazon Basin in northwest Brazil is where these Black Swifts spend their non-breeding season – a suitable place for such an elusive species. Food is bountiful in the Amazon where beetle diversity can reach 700 species in just one tree. Elevations are not high within their wintering area, but there is plenty of topography as shown in the map’s inset. In nature most species are not distributed randomly or evenly but are found in some sort of pattern. RMBO tested the spatial distribution of the winter locations the three geolocators recorded and found they were, indeed, not randomly or evenly distributed but in a clustered pattern, giving another bit of credence to the data. Black Swifts continue to intrigue us with more unanswered questions, i.e., do they roost on the wing or on the ground? The answers will emerge with further research.